You have to make a lot of compromises in life, but you should not have to when purchasing leather dining chairs. Leather is the ultimate in style and comfort, but let's face it--leather is not cheap. If you are willing to pay more for leather dining chairs you should not have to settle for a limited selection. Just because our chairs are affordable does not mean that we skimp where quality is concerned. Your chairs will be made (just for you) of the finest materials using solid hardwood frames, heavy gauge sinuous springs and high quality foam cushions. Of course, exceptional materials mean nothing without having the expertise to assemble them. Many of the people building your leather dining chairs have over 30 years experience and view their job as an art. All this is backed up by a life-time frame warranty from a company in business for over 20 years. Many do not know that all leather is not the same. There are different styles, grades and ways of coloring. Most have their pros and cons. Through much research and experimentation, we've decided to use aniline leather. This type provides the most soft and supple texture while being easy to maintain and long lasting. When you have questions you want a real person to talk with--someone that does not work in an isolated call center. When you contact us you'll talk to an actual person--a person that actually works in the factory where your chairs are made. You'll likely talk to the same design consultant each time you call and will get to know and trust them. They are there to help you. 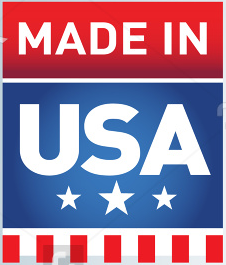 And if you're ever in Hickory, North Carolina give us a call and we'll give you a tour of our factory. 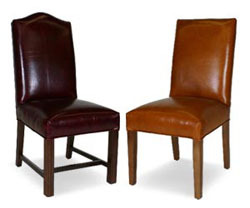 Take a few moments to have a look at our leather dining chairs. We encourage you to order leather and finish samples so you can see the exceptional quality of the material used for your chairs. Remember, the choice is yours. You have the power to bring out your style and personality in your home.